Diamond Comic Distributors has released its full comics sales report for February 2017, and the Comichron estimates based on those sales figures are now online. The estimates now appear on our master page for February 2017 Comic Book Sales, and are sortable and searchable. As mentioned here Friday, February was another month in which a lot of comic books were shipped to the Direct Market at relatively little cost to retailers, although for a different reason than in January. That month, Marvel’s 10% minimum overship resulted in the largest number of comic books sent to market in any January since 1997. This time, it was Image’s 25th anniversary — and its promotionally priced comic books — that caused the largest number of new comic books to be shipped than in any February since 1997, according to Comichron’s analysis of data released today by Diamond Comic Distributors. More than 7.85 million comic books were shipped by Diamond to retailers in North America, and more than 750,000 of them were copies of Walking Dead #163, which retailers ordered at its 25-cent cost. Special no-cover-price variants were also offered for retailers who ordered 250 copies or more, and again for 500 copies or more. Diamond does not include comics cover-priced under a dollar in its Top Sellers lists, a move made after Batman: The Ten-Cent Adventure, a nine-cent issue of Fantastic Four and a 13-cent Gen13 topped the charts in 2002, along with all the original Free Comic Book Day issues. (We removed those issues to the tops of their respective months, with asterisks rather than rankings, in the Comichron charts.) 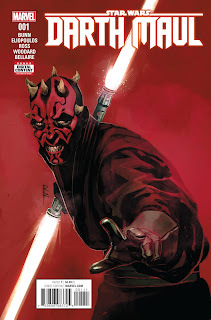 So while Diamond acknowledged the performance of the Walking Dead issue in its press release, it ranked Marvel's Star Wars: Darth Maul #1 as the top-seller for February. The 25-cent Image copies resulted in a lopsided market share reading for the company; its unit share was 18.13%, as compared with a 9.58% dollar share. While Diamond’s unit shares from month to month can be found on Comichron’s individual monthly pages, it isn’t something we keep a trendline file on (in part because of volatility like this) — so we can’t really say the last time its unit share hit such a level. The 9.58% dollar share is Image’s best since January 2016, so while it’s on the high end, it’s hit loftier marks relatively recently. 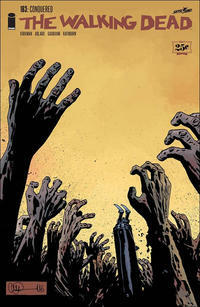 We see the absence of the Walking Dead issues from the charts when we add up the sales of the Top 300 comics. 6.33 million copies of the Top 300 comics were sold, but 7.85 million copies were sold overall. That's a larger than usual gap unaccounted for, and includes the Walking Deads. The numbers for the 300th place title are better than those for the 300th place title a year ago, which is a good sign. What was selling in Feburary in years past? Check out of Flashback column for the month. Last Friday I participated in an Ask-Me-Anything about all matters comics-related on Reddit; click to read it.